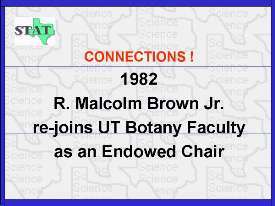 RMB remained on the Botany faculty until 1968 when he took an NSF Fellowship to study in Freiburg i. Br. W. Germany Then in 1969, RMB moved to The University of North Carolina at Chapel Hill. Little did he know that 13 years later he would be invited to return to his alma mater as the first holder of the Johnson & Johnson Chair in Plant Cell Biology.